The food: When I was little, my mom never bought granola bars. Why spend money on something you can easily make? It’s been a couple of decades, but the smell of toasting oats still takes me back to my childhood kitchen. Although I grew up with homemade granola, I’ve been guilty of buying bars. No more! My mom was right (don’t tell her I said that): Why buy what you can bake? Bonus: There are none of the scary preservatives and additives that come in what you get from the grocery shelf. The music: I’ve decided there’s a good reason for calling the message-driven hippy music from the 1970s “granola”—it pairs perfectly with this wholesome food. 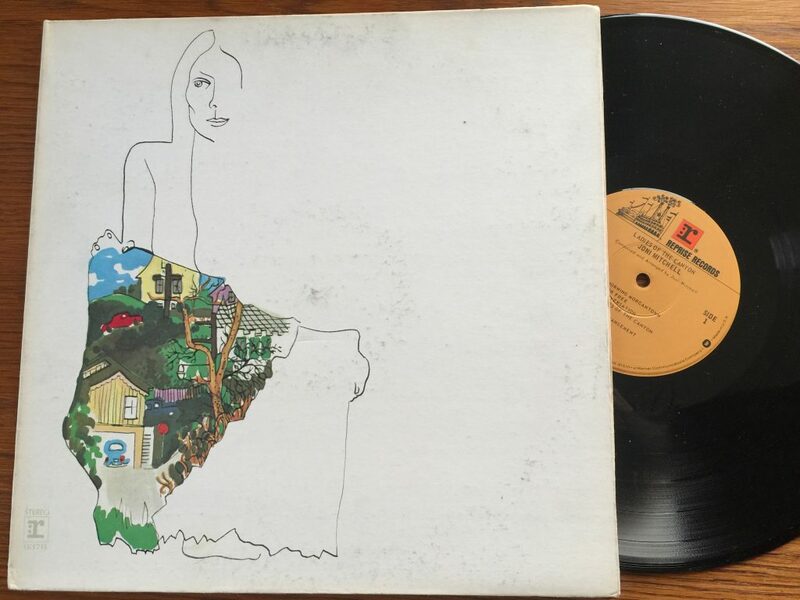 A great example of the era is Joni Mitchell’s beautiful 1970 album, “Ladies of the Canyon.” Mitchell’s third studio album arguably features some of her biggest hits, particularly “Big Yellow Taxi” and “Circle Game,” and is stacked with sophisticated lyrics and elegant vocals. Plus, the cover artwork is a Mitchell original, as were all her covers (she’s also responsible for the “So Far” cover for Crosby, Stills, Nash & Young). Listen to Side 1 while you make your granola, then sit down with a cup of hot tea and really focus on the beauty of the superior Side 2. 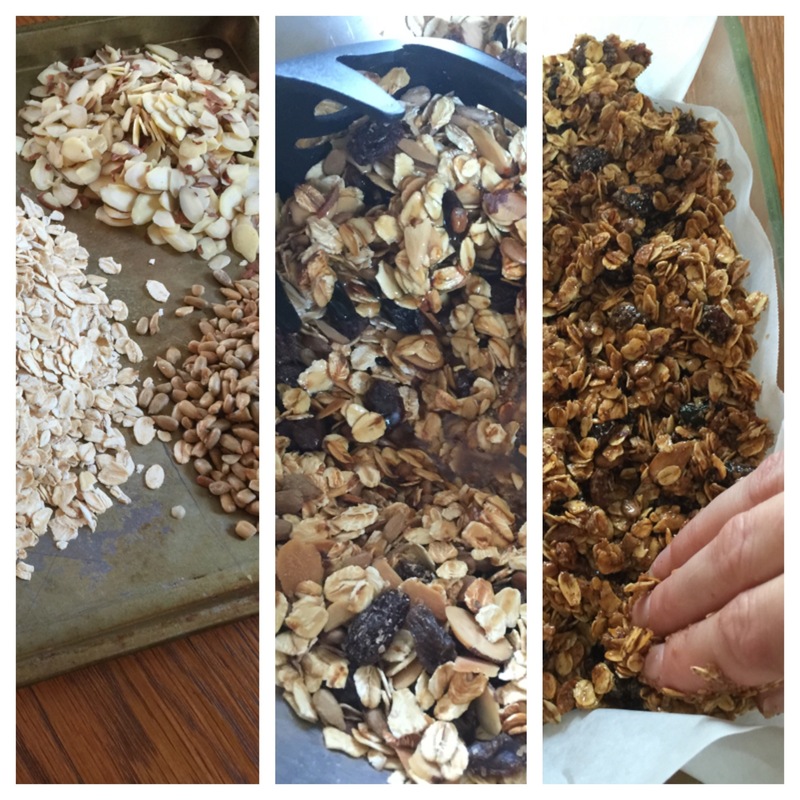 Making granola bars boils down to these simple steps: Toast your grains, nuts, and seeds (below left), mix those with dried fruit and the honey-sugar-butter mix that acts as the binding agent (below center), then press the mixture into a lined dish and bake for 30 minutes (below right). As a note, I added wheat germ to my granola because it boosts the protein, but you could drop it if you are gluten free (and maybe add flax seeds for a nutritional punch). In fact, what makes granola bars so great is that the possibilities are nearly endless—customize yours through experimentation. Maybe you’d prefer pecans and butterscotch pieces, or coconut and chocolate chips. Have fun and make them your own! Wrapping your creations in parchment paper and adding a ribbon is also a great way to turn them into a healthy gift for a birthday or holiday. This is a smart gift for friends watching their diet. It’s also just a nice way to make your own little treats feel more special. Don’t just stop at granola bars. Try my recipes for Overnight Oats or Oatmeal Raisin Cookies, too. Coat a 7x11-inch baking dish with butter and line with parchment paper. Set aside. Spread oats, almonds, and seeds on baking sheet and toast for 10 minutes, stirring occasionally. Watch carefully so they don't burn. When toasted, place mixture into a large bowl and combine with wheat germ and raisins. Set aside. In a small saucepan, cook butter, honey, sugar, vanilla, cinnamon, and salt over medium heat until sugar is dissolved. Coat oatmeal mixture with sugar mixture, pour evenly into baking dish, and lightly press down. Bake for 20-30 minutes, until golden brown. Cool to room temperature before cutting into squares. Store in an airtight container. My little guy would love these! I’m going to pin and hopefully make them this weekend! Too late, she read it. You know moms are always right, don’t you? One of these days you will be using coconut oil for everything too! 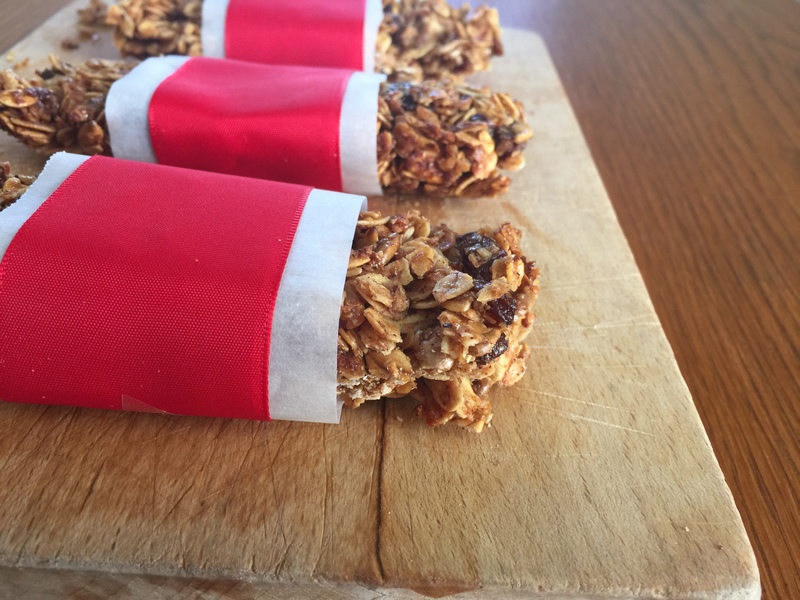 Love these granola bars, they sound just perfect! Thank you so much for reading and commenting, Mary! I am with your mom. I pinned these to try. 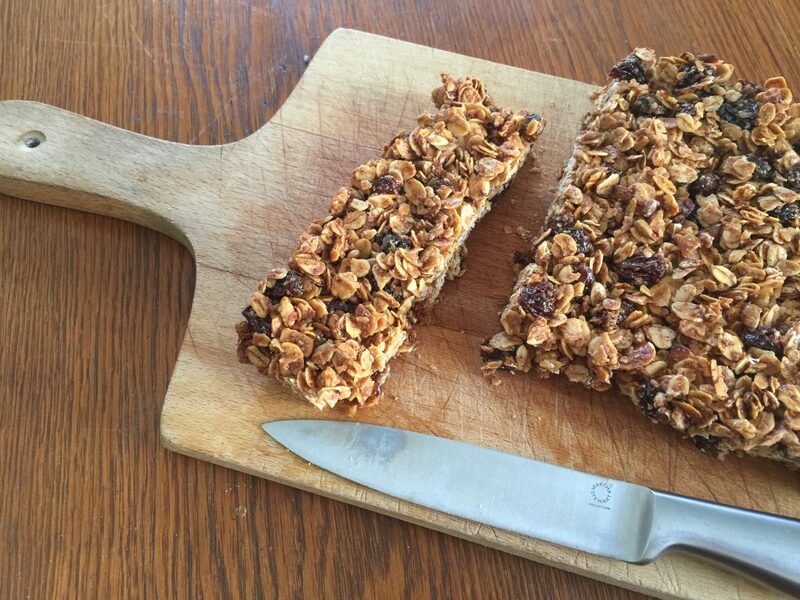 I have been making my own granola and bread, and have been looking for a good granola bar recipe. Thanks for sharing! Yummy, it is always better to make your own whenever you can.